Rarely available and greatly coveted is this single level (no steps! ), soft contemporary, energy efficient, 2 BR, 3BA home in the Historic Eastside within walking distance to Canyon Road and the Plaza. Built in 2011 by Doug McDowell, and located in the small, private compound of Las Placitas, this gorgeous 2,359 square foot residence offers an open floor plan with high beamed ceilings in the great room, a gourmet kitchen, ample wall space for your art collection, and wonderful natural light. The two bedrooms are well separated for privacy and enjoy en-suite bathrooms. The home also offers a powder room, oversized laundry room, and a 2-car garage. Step out through the French doors onto an inviting portal nestled in a high walled garden with rock spillway fountain and outdoor fireplace perfect for entertaining. Other features include concrete floors, custom woodwork, an irrigation system, solid masonry construction (ICF), and smooth trowel plaster walls. This residence is also LEED Gold Certified and includes a state-of-the-art efficiency evaporative cooling system, air filtration system, photovoltaic electric power, in-floor radiant heat, a solar domestic hot water heater, and a home water catchment system. 3. Gas Burning, Fireplace, 2 or More Fireplaces. 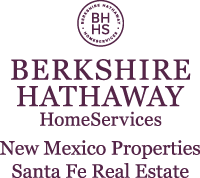 I am interested in 612 Garcia Street, Santa Fe, NM 87505. Sign up for Inside AccessTM to view recent sales near 612 Garcia Street.